Well we were a little late getting David Chang’s Lucky Peach magazine, our friend Gord first told us about the issue, and ever since we’ve been trying to get our paws on a copy. 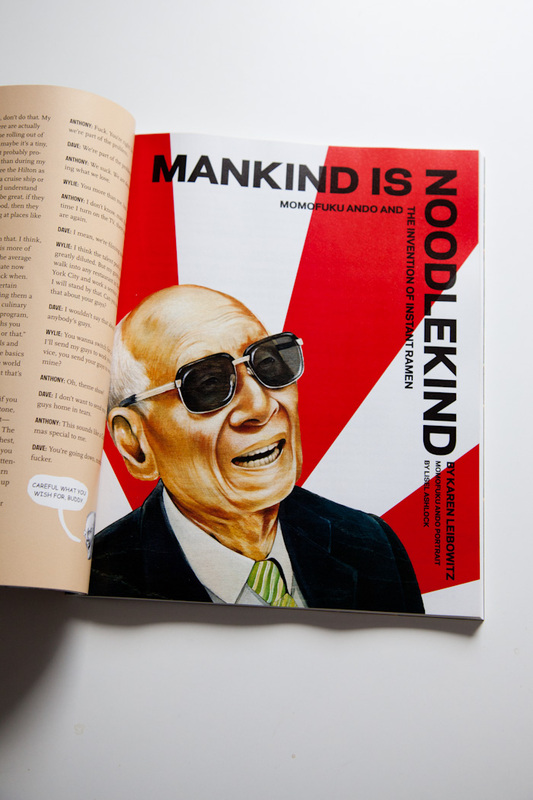 The first issue was of particular interest because it’s the “Ramen” issue, something we’ve grown addicted to since our trip to Hokkaido. 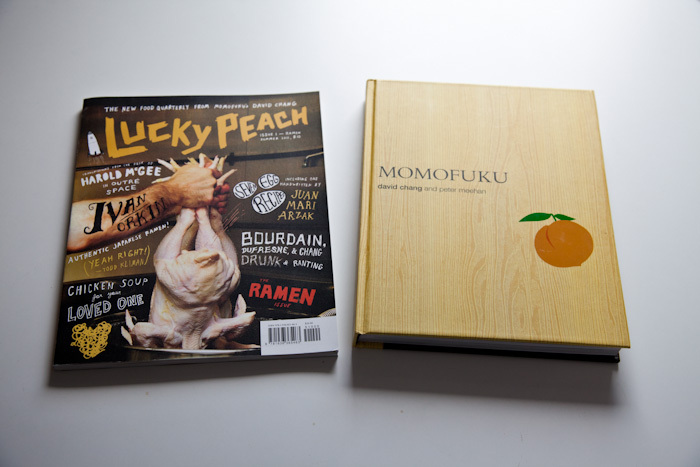 The Momofuku book was loaned to us by Kai, a friend of the shop. He always comes in and talks about his experiences in Japan and abroad and thought we’d appreciate the story telling in the cookbook. On that note we have some news! We’re going to making another trip to Japan during the 2nd week of September. We’re going to be traveling around Kanazawa, Kyoto, and a couple days in Tokyo. 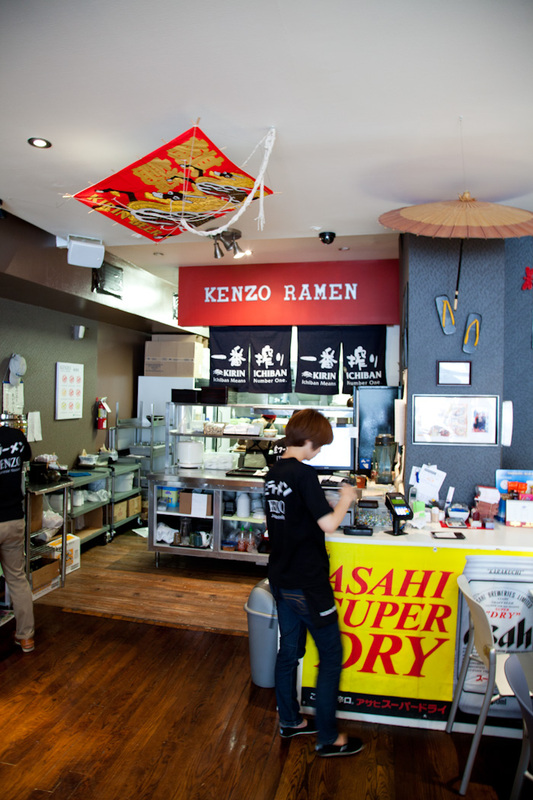 After planning this trip and reading all about ramen we thought we’d have lunch at Kenzo, arguably the best ramen in Toronto! 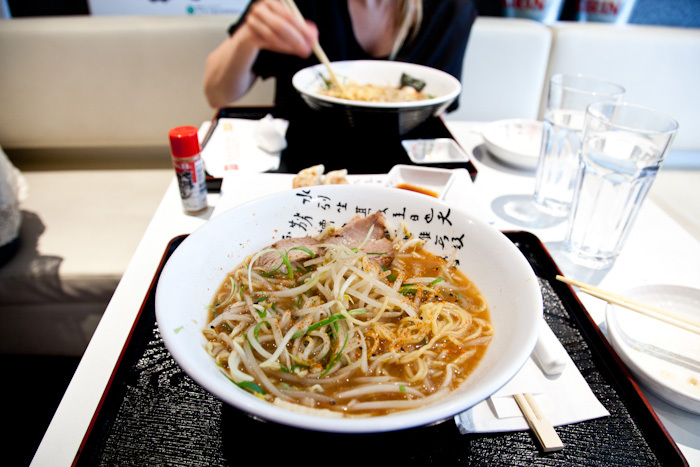 We both ordered the miso ramen. We ask to get some additional garlic paste and spice to get it a bit closer to Asahikawa ramen, our white whale of ramen. 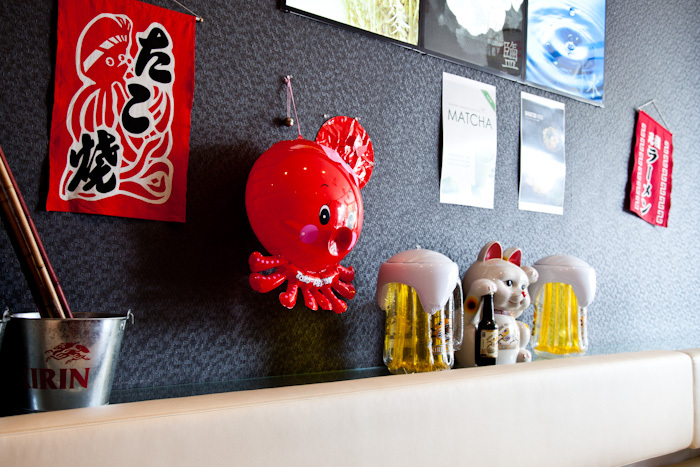 The place is bustling with Japanese students at lunch but we got a table, and it didn’t take long to get our order of gyoza and ramen. Besides the social aspects of traveling, our favorite thing is always food so we’re excited to try new places and share them all with you. Hopefully we’ll have some great workshop tours as well. If you won, you’ll be getting an email from us shortly. If you lost, you can always buy a tea towel through our webstore! We hope everyone is having a fantastic summer! 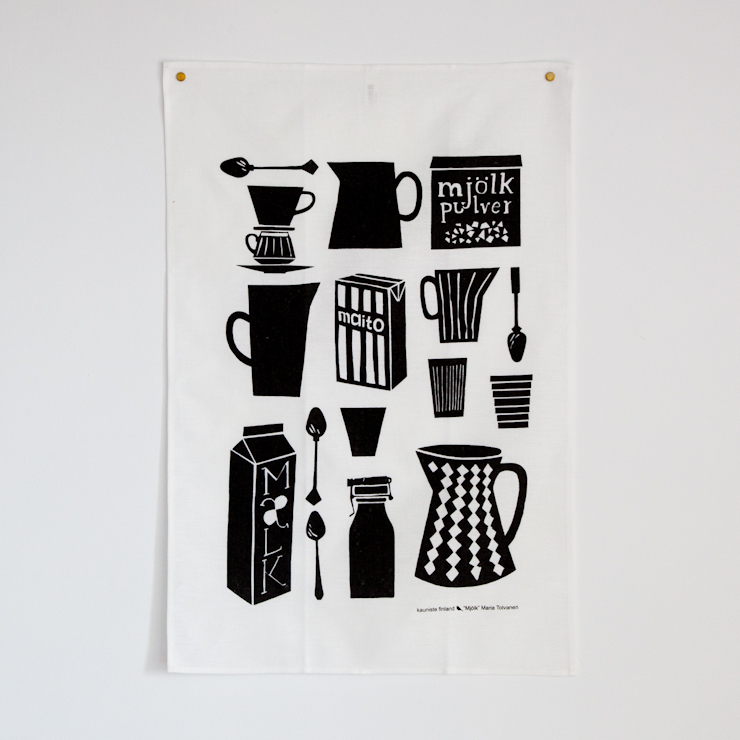 We’ve been very busy but not too busy to share our new tea towels with you. 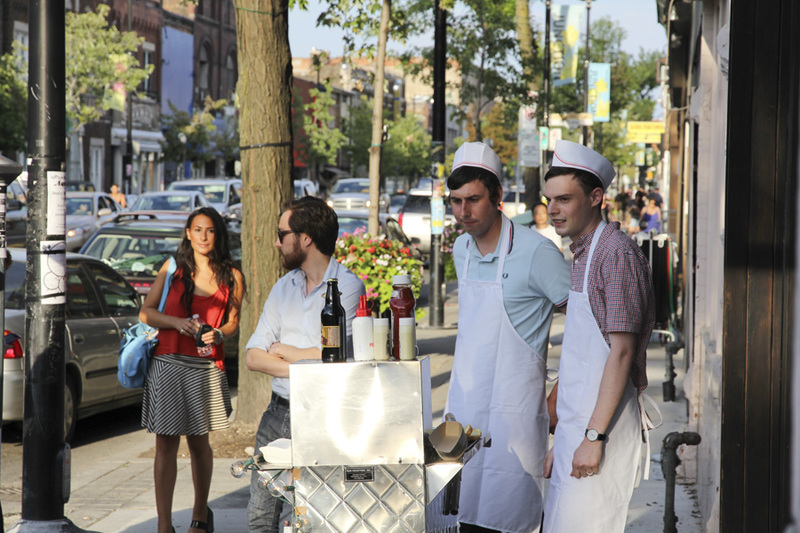 We feel especially close to the people we’ve been working with, who have grown along with us since opening our store. Kauniste produces our favorite tea towels, and the moment we received our first shipment we knew we wanted to collaborate with them some how. 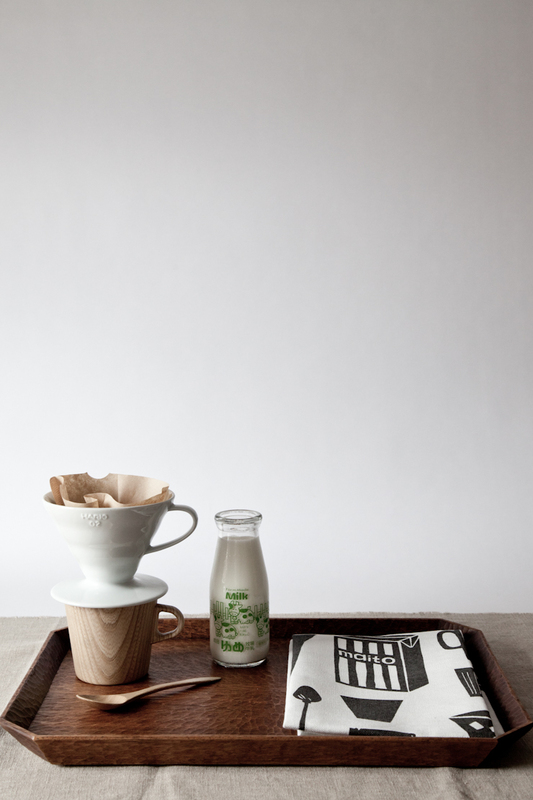 It was a few orders later that we asked them if we could work together to produce a Mjölk (milk) themed tea towel, and in the beginning it just didn’t seem like time could permit the project, between the two of us growing our businesses we just didn’t know if the idea would get off the ground. It wasn’t until our trip to Helsinki that Milla and Hiro surprised us with some milk inspired illustrations by Maria Tolvanen. We were thrilled they had pocketed our idea and had taken it to the next level of getting ideas on paper. Over the next month we worked with Milla, Hiro, and Maria tweaking some of the design and we couldn’t be happier with the result. 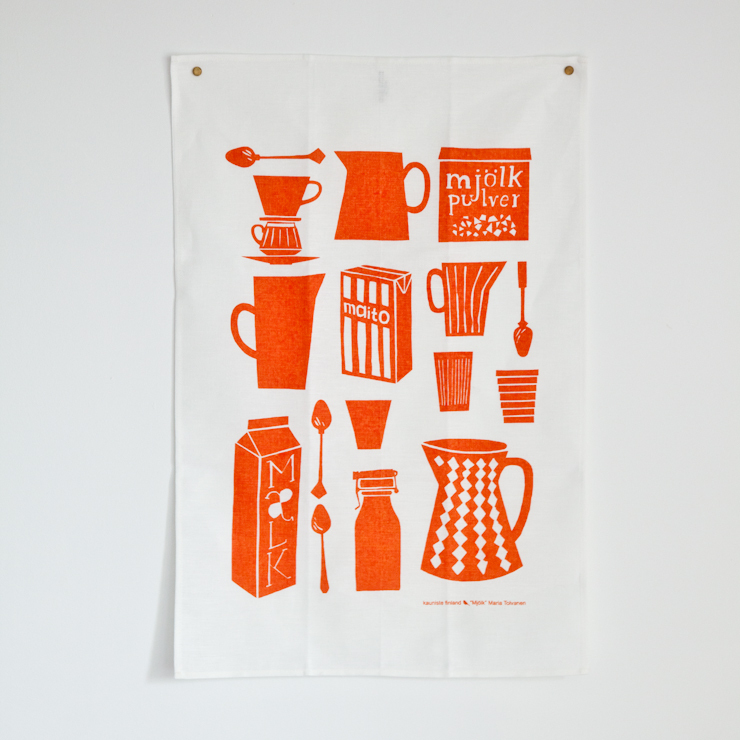 The tea towels are available in three different colours and feature some of our favorite things including a few nods to classic Finnish design. Can you spot them? 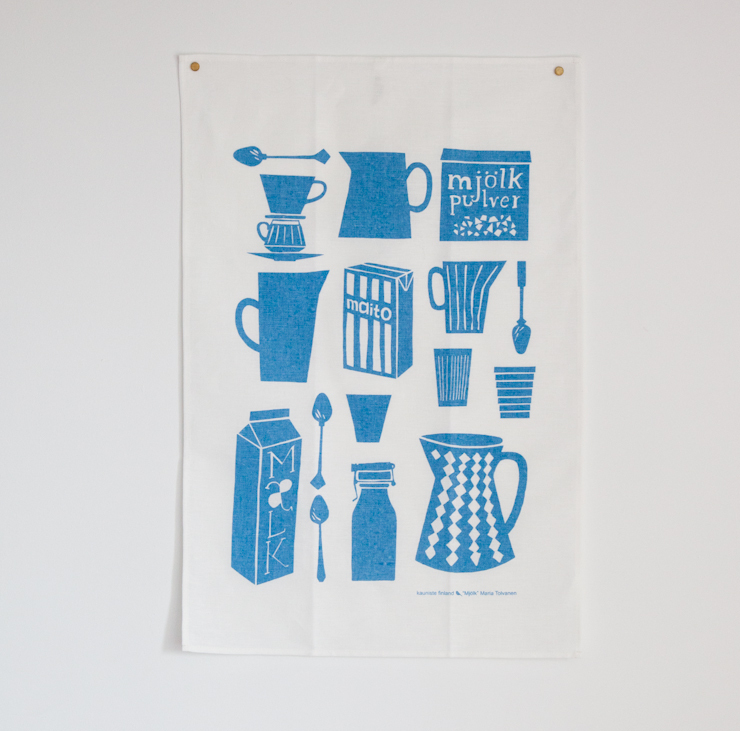 To celebrate receiving the tea towels we thought it would be nice to do a free giveaway! All you need to do is leave a comment, we’d love to know what you think of the towels and which colour you like best! 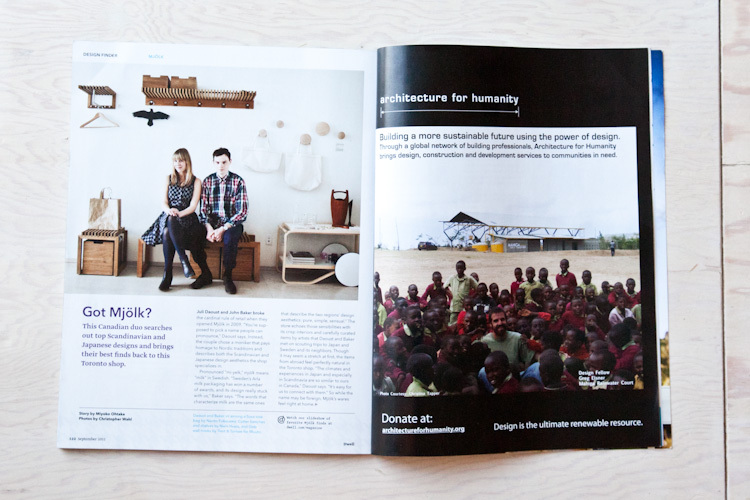 Have you read the newest issue of Dwell yet? 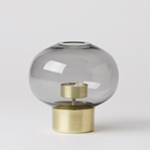 We’re thrilled to be included in the new September issue. 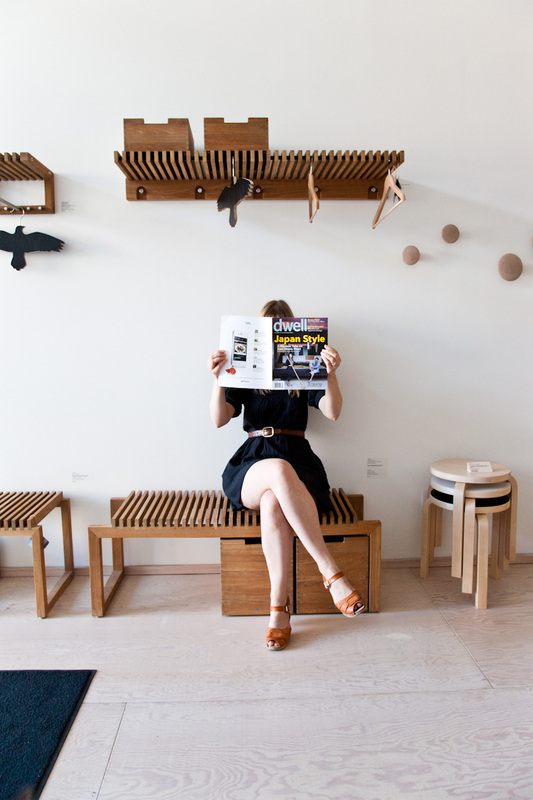 We’ve both been avid readers of Dwell for years and our collection of Dwell is cataloged in our bookcase, it’s the type of magazine that you can pick up back issues and still appreciate their relevance. Please check out this issue, it’s one of the best issues we’ve read regardless of if we were featured or not. We’re really surprised how much it struck home with us, from featuring charred cedar (which we implemented on our own facade), a tour through Marimekko, and our favorite of all: Ken and Shino Mori’s house tour, which is one of the most beautiful homes we’ve ever seen. 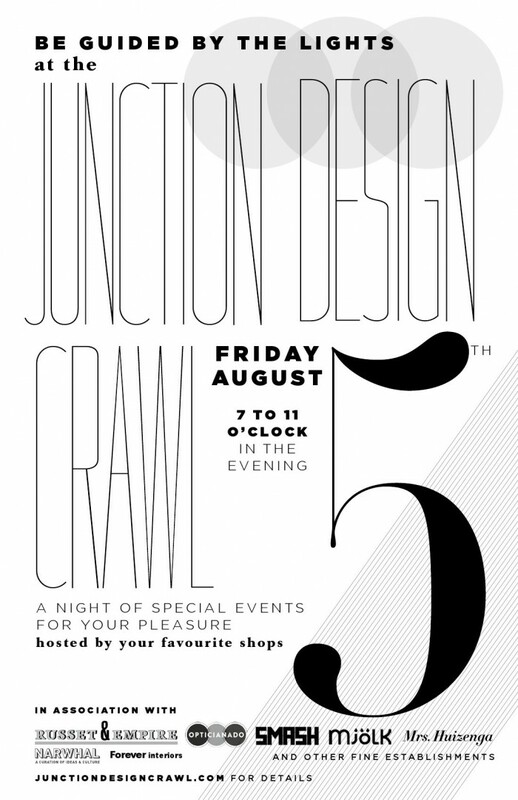 Friday night was the launch of the first Junction Design Crawl. 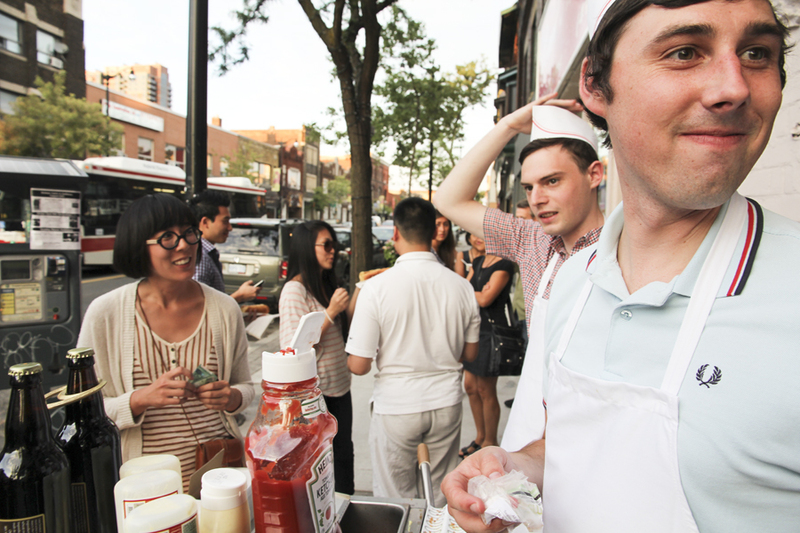 We had a special evening planned with an Icelandic hotdog stand and an installation by architect firm Studio Junction. Juli and I were both busy so we were lucky that our friend Bradley came to take some beautiful photos of the event! 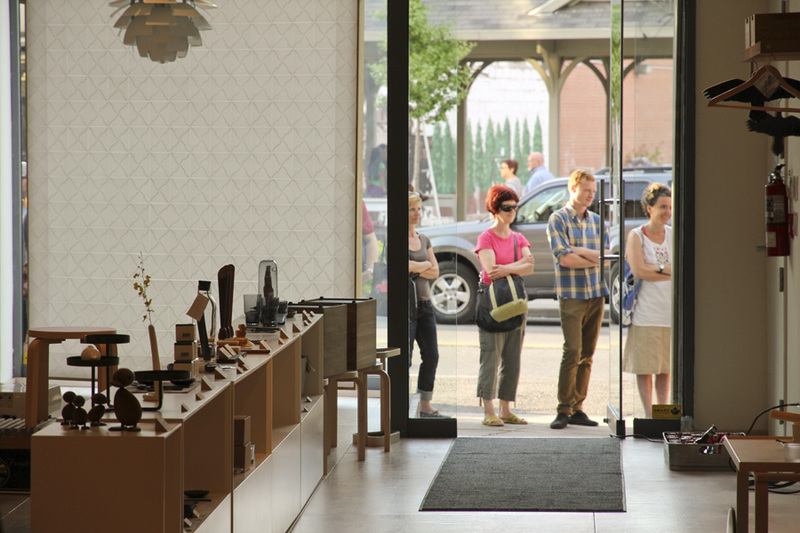 We didn’t know how many people were going to show up, but by 10 minutes to 7pm a line was starting to form. 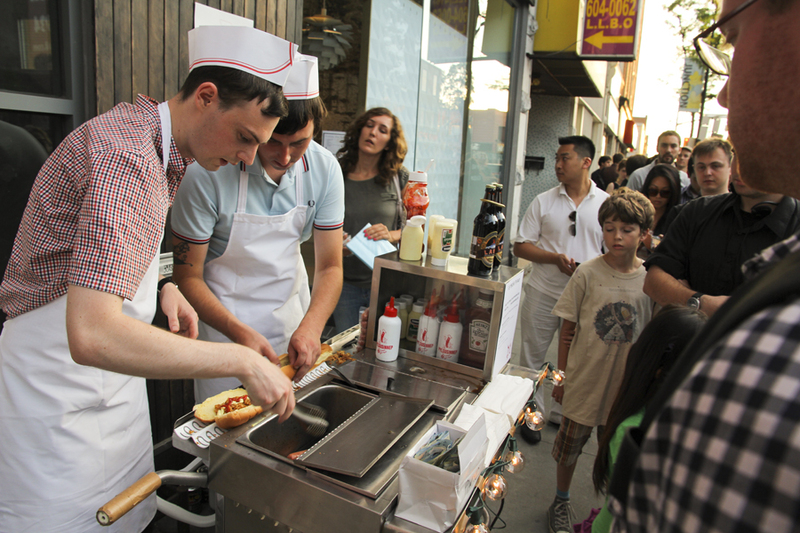 As we nervously waited for the hot dogs to cook through in the beer filled steamer, we watched the line grow to the end of the block. 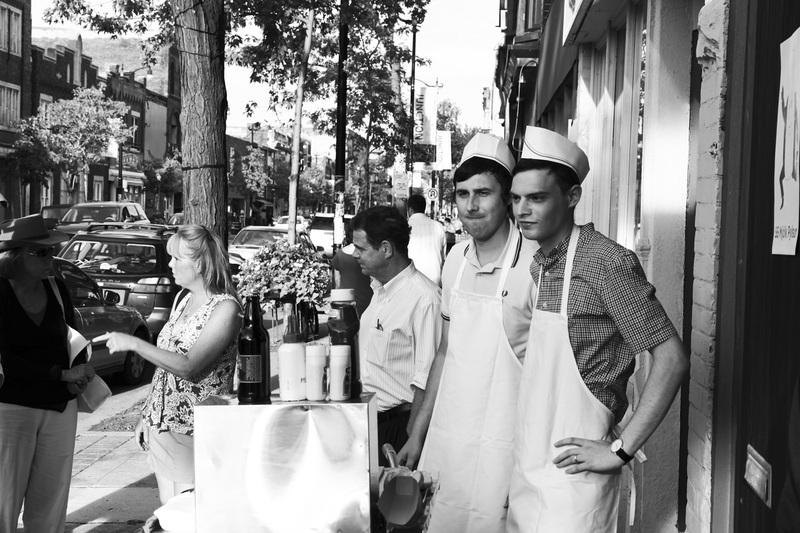 My brother Frank was my wing man, and we wore paper hats and aprons to complete our hot dog outfits. 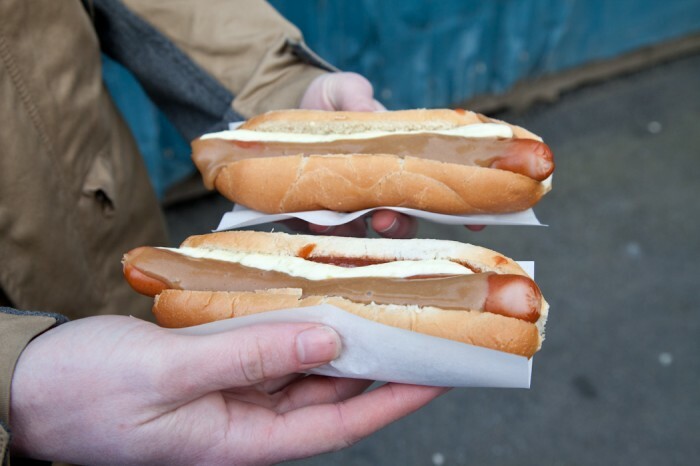 The first dozen people in line had all tried the authentic pylser in Iceland, and while the hot dogs cooked we chatted about the best way to make and serve the hot dogs. 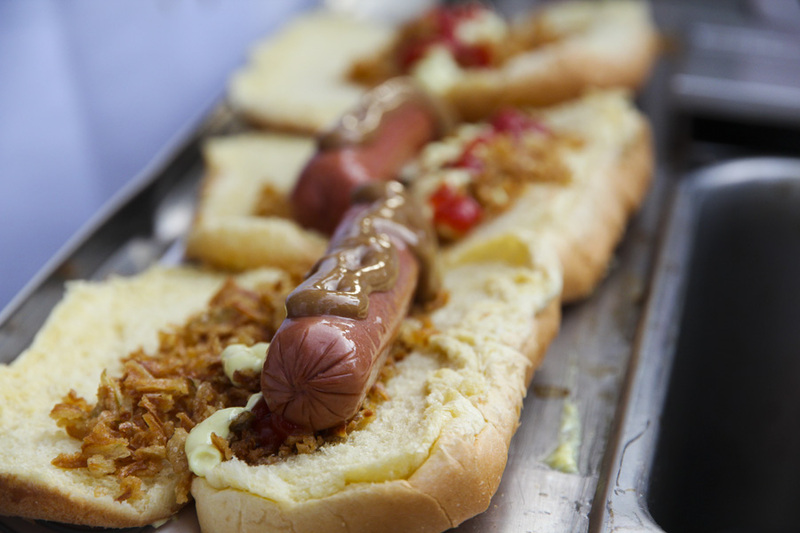 The consensus was first to make a bed of frizzled onions, then the remoulade and a single line of ketchup, then the dog, and last a good helping of sweet and tangy Icelandic mustard. 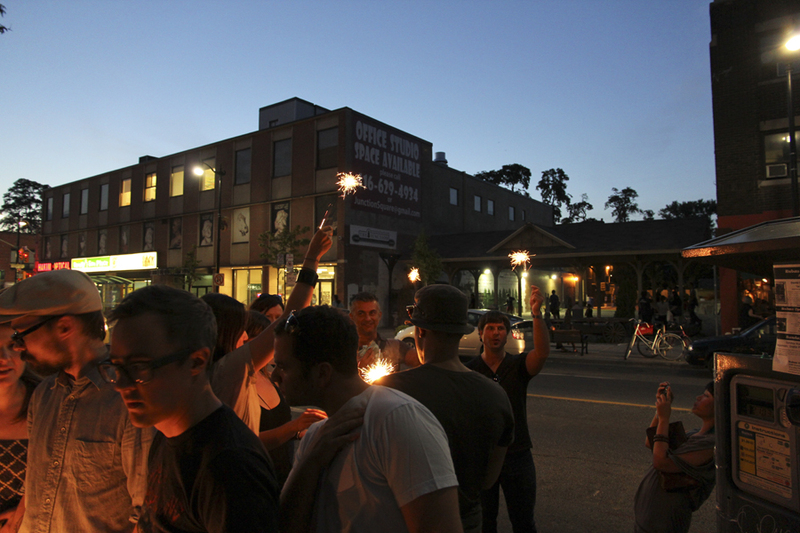 You can see Studio Junction’s brilliant installation in this photo. The screen is made of individually folded blocks made from a paper like material. After dark we projected a Sigur Ros video, with the result from the outside being cool pixelated forms. 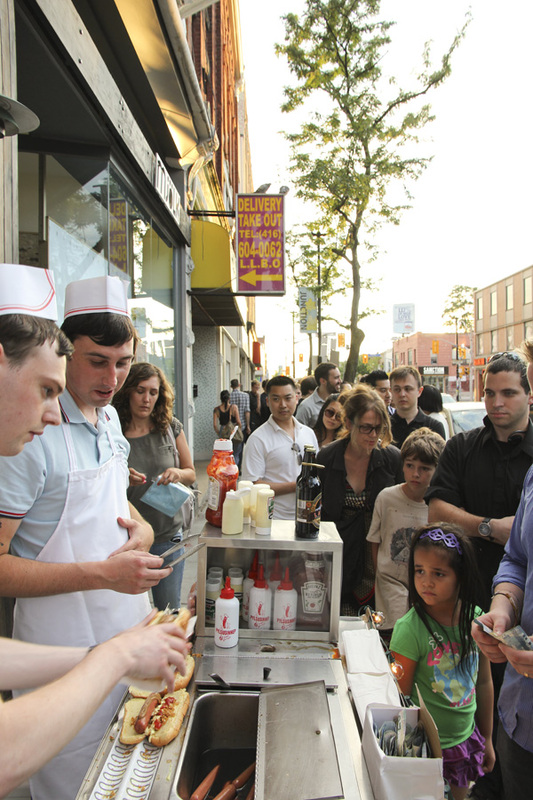 After we got started it didn’t take long to pin down the formula, and decide on our roles in the hot dog making. We started at 7:00 and had a consistent line up until we sold out around 9:30. 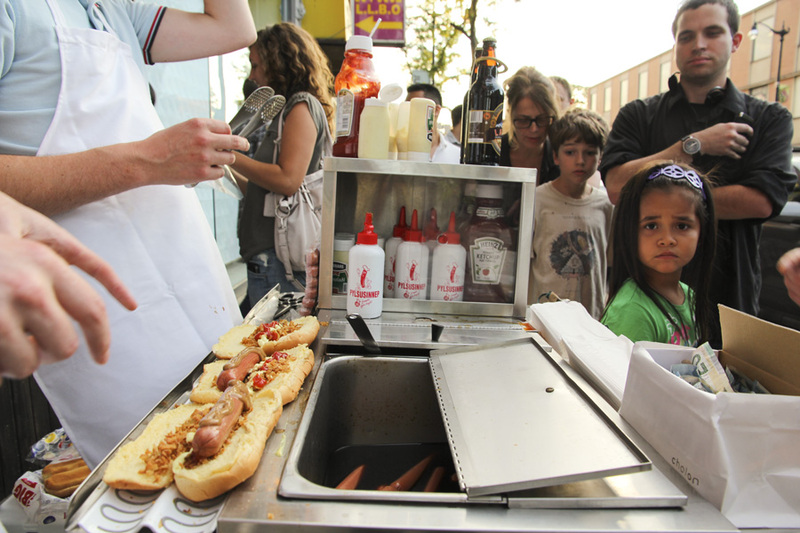 I think all in all we sold around 200 hot dogs on Friday! That’s just ice from the cooler. 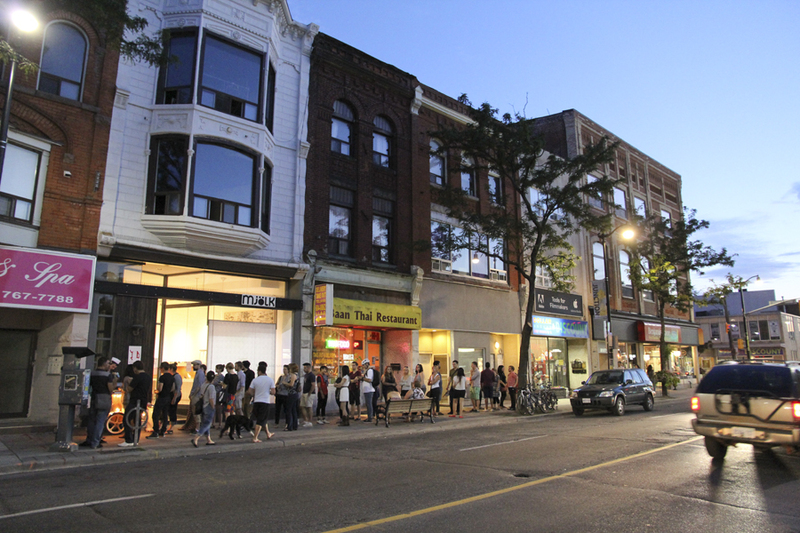 It’s also funny because it looks dead out but the street was still really busy…Margret and Narwhal were both hopping and we couldn’t close our store until 11, because large groups of people kept showing up. 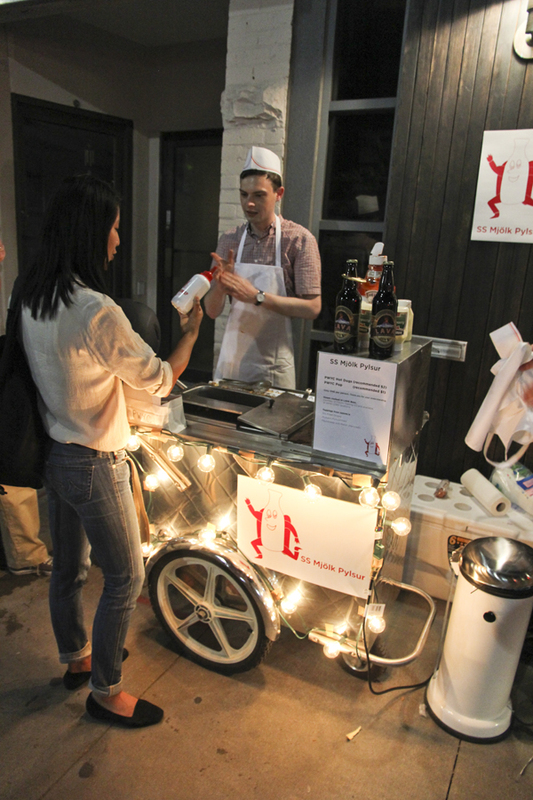 A big thanks to the other businesses that contributed to the event, and for everyone who came out to support! 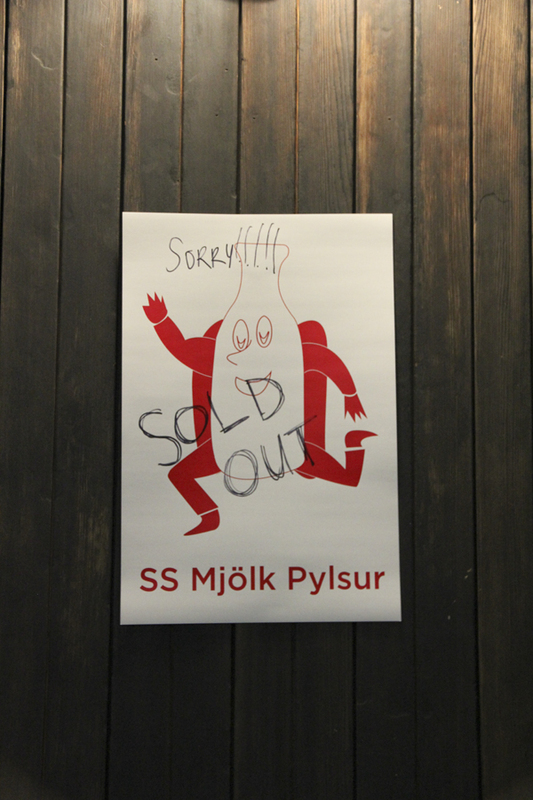 Mjölk is recreating Reykjavik’s “Bæjarins Beztu Pylsur” in front of their shop–with a cheeky nod to their logo. Come join us on Friday, August 5th, from 7-11pm, or until the dogs are all gone. 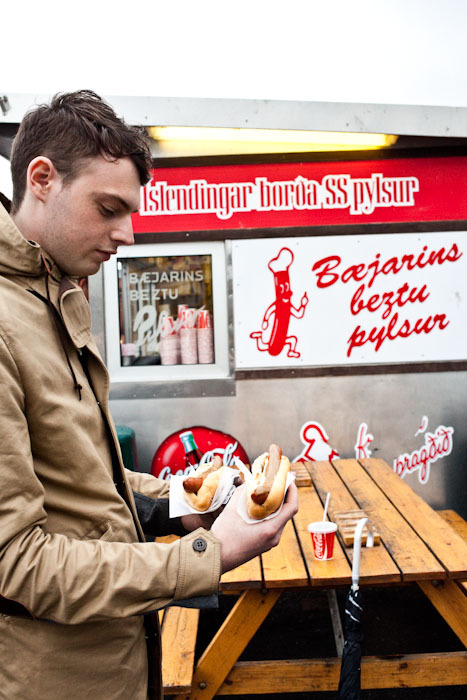 Bæjarins Beztu Pylsur means “The best hotdog in town” and after 60 years in business they have become arguably the most famous hot dog stand in the world. 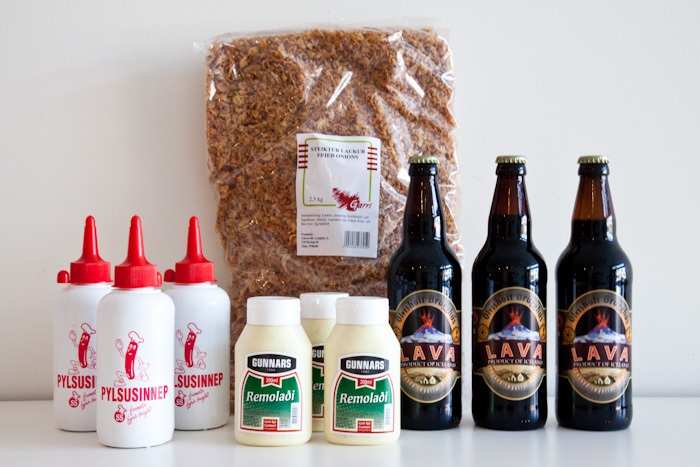 We will be cooking the hot dogs just like at Bæjarins Beztu Pylsur, steam cooking them in LAVA beer (courtesy of Fitumi Trading Co., who imports Icelandic Beer which you can buy at the LCBO), and importing all of the authentic toppings including a special Icelandic mustard, remoulade mayonnaise, ketchup, and frizzled onions directly from Iceland. 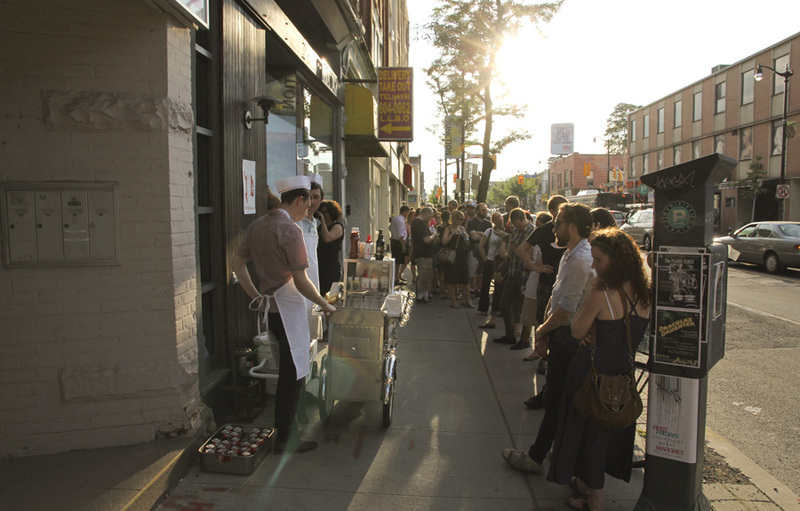 After you’ve had a hot dog, visit the other participating shops and galleries (on Keele north of Dundas, AND on Dundas west of Keele to just past Pacific)–Narwhal Gallery for an art opening, Russet & Empire for Paper Moon Photography, Opticianado for a history of eyewear, Margret bar for the after party, and more!